Ideal for moulding precision parts with accurate process control and high productivity. VE series are state-of-the-art, Vertical, Hydraulic, PLC Controlled Rubber Screw Injection Moulding Machines (25 & 50 tons) with 4 post type clamp and reciprocating screw designed to maximize the accuracy of the shot size. The injection unit on these machines is designed for shot size accuracy of /- .3 gms. VEC series are 25 & 50 ton screw injection moulding machines designed with a 'C' frame type clamp for unobstructed loading of inserts or extrusions and ease of removing moulded parts. The C frame injection press is fitted with exclusive deflection protection which assures perfect partingline parallelism. The open side clamp allows work pieces to extend to right and left of machine for corner moulding of weather strippings/profiles, gaskets, insert moulded objects & other hard to handle inserts. They are also used for precision moulding of encapsulated electronics, medical products, insert moulded plugs & connectors and many other applications. Maximum Injection pressure: 20,000 psi. Integral Hydraulic System features pump & electric motor matched to requirement providing control of clamp & Injection functions for maximum productivity. Manifold based hydraulics reduces the piping & leakage potential. 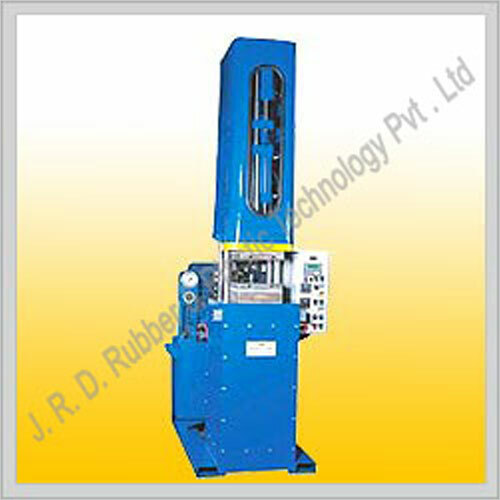 The hydraulic components of plastic injection moulding machines are easily accessible for quick maintenance. The advance hydraulics on the machine provides for mould safety circuit to protect expensive tooling from damage. Maximum Injection pressure 20,000 psi.